A little over a month ago the game blogs lit up with news about OpenEmu, a program that was supposed to be the be-all-end-all of emulators. You might have used emulators in the past to relive the glory days of Bayou Billy, chances are that your experience might have been a bit lacking due to any number of reasons from controller support to OS support. The biggest hurtle for some of us might have been finding an emulator that works well on the Mac, for example. 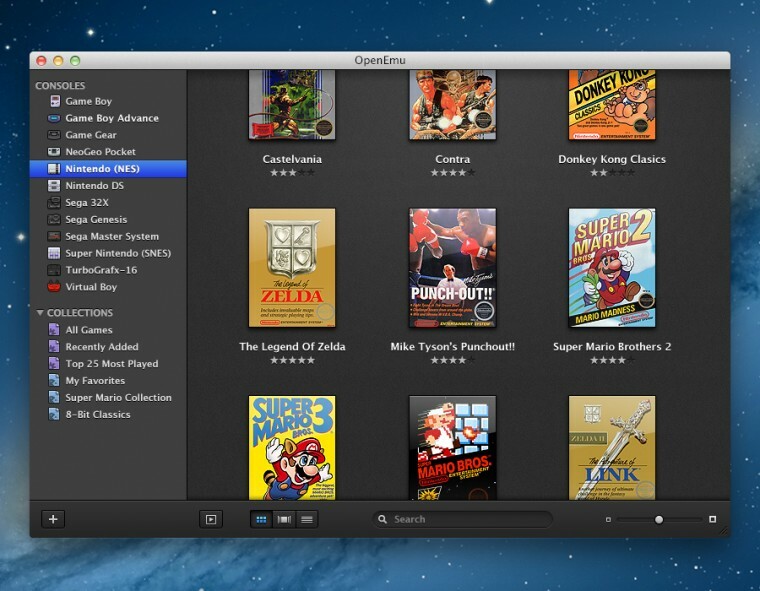 Well fret no longer, Mac friends – sorry PC, you’ll have to settle for the dozens of emulators already written for your platform – because OpenEmu does solve a lot of these issues and wraps it all up in a pretty package to boot. In testing out the program over the weekend, my experience was 95% positive. Only a couple of things stood out as a little awkward or frustrating, but we’ll get to that. On the positive side of things you might notice very quickly that the program doesn’t look like week old dog excrement like most other emulators. 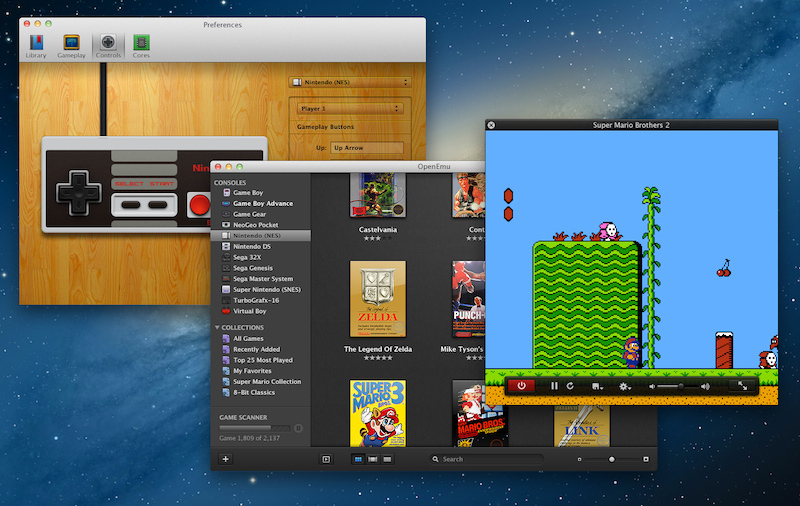 Actions in the library are all very “Mac like,” and your library of games is arranged in a way that OS X users will feel comfortable with if they have ever used the Finder or iTunes, with big, tiled images of games. OpenEmu will attempt to find box art for the game when you place it in the library (by a simple drag/drop), but if that doesn’t work you can use any image (again, by just dragging the image). The program in this regard is definitely a pleasure to use after having used alternatives throughout the years. Also, a big thumbs up to the guy who said, “let’s make lots of controllers work with this thing out of the box.” As of this writing, fourteen of the most popular controllers out there will be automatically mapped to have correct controls. This includes Xbox 360, PS3, PS4(! ), and Wii controllers. Your other USB or Bluetooth controllers should work, but you’ll have to map the controls yourself (a painless process, really). 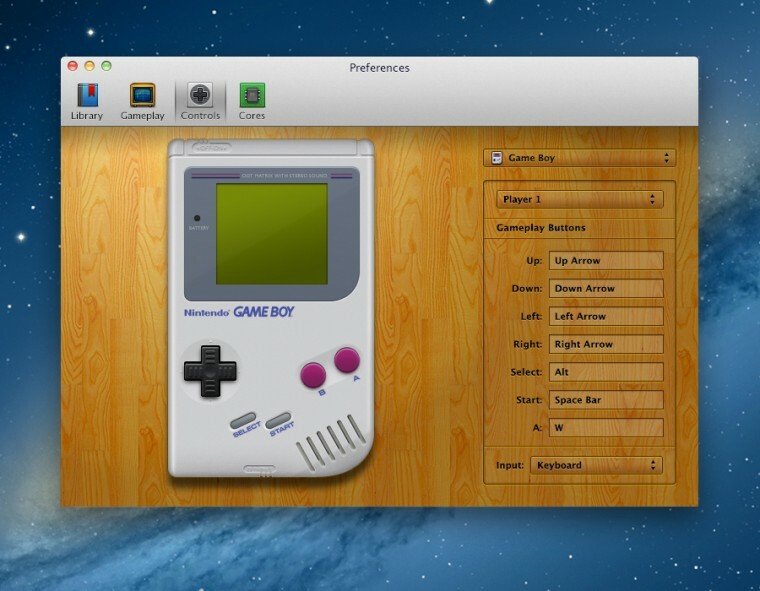 OS X is able to pair pretty effortlessly with Wii and PS3 controllers via Bluetooth and has for years, and OpenEmu makes the process pretty simple. For each “system” installed in the program, you can set up control schemes with whatever controller you want. I was using the Wii remote during my test, and like the Wii itself, you simply tell the program to start searching for a controller and then you tap the 1 and 2 buttons on the Wii remote. It connected in less than five seconds and was ready to go. The only thing that I had an issue with was initially connecting the Classic Controller for use. For several attempts OpenEmu wouldn’t recognize that I had the Classic Controller ready to go, but a restart of the program and a re-pairing of the controller ended up fixing the issue. It was just a little more work than I had hoped there would be. After that, though, the Classic Controller always worked, so I will just assume that little things like this might be ironed out in the future. OpenEmu comes with thirteen “cores,” or emulators, built in. It doesn’t handle all of the emulation itself, instead using software from other open source projects to effectively run the game software. So, ironically, though I have been bagging on some of these other emulators for looking like trash, OpenEmu actually uses the software from some of them and then wraps it all up in a pretty package. Whatever the case, for the end user it works well, and no one up until now has been able to consolidate all of these things into one big, easy-to-use library. Now to the only big gripe I had over the weekend: saves. I had one instance where the program crashed on me, and it was after a three hour play period in the fan translation of Mother 3. It also happened to occur about an hour out from the end of the entire game. Now, a crash in and of itself wouldn’t be too terrible, but it turns out that OpenEmu wasn’t committing my saves throughout that whole time while the game was running. So even though I had been saving the game at proper save locations along the way, when I rebooted the program the last save still available was for 3 hours and ten levels prior to where I was. A heart-sinking incident indeed. I did some testing, and sure enough, the battery-save file for the game wasn’t being updated until after I stopped playing the game, which from a user perspective sounds pretty dumb and makes saving the game feel a bit useless if your progress can all disappear because OpenEmu wasn’t updating the file when you actually saved it. There might be a programming limitation that answers the question of why this is the way it is, but I would simply suggest every so often restarting the game so the program commits your saves accordingly. On the flip side, and this a feature that is actually really nice, any time you do stop your game, OpenEmu will create a save state automatically, so the next time you play you can jump right back to where you were. I’m not sure if that feature works across all “cores,” but I would assume it works for any that you can make a standard save state for. In the example above, since the whole program crashed, it didn’t have time to create this file, so I was borked either way, but the auto save state is super nice. Hopefully that last big paragraph didn’t scare you away from the program, because OpenEmu definitely is the best emulator out there right now, especially in terms of ease of use and compatibility with controllers you probably have laying around anyway. If you are really jonesing to play Solomon’s Key up until the twelfth level or so when the flashing, sparky dudes are all over the place that make you remember why you never beat the game and why you hate Dana because he can’t jump the way you want him to, then buy it off of the eShop you heathen. But if it’s something you couldn’t otherwise find, OpenEmu is a great application and one you should check out. It appears to only save the battery backup save if you start the next game resuming from the save state saved when exiting the game. Personally, I’d prefer if it saved the battery backup separately. This would give us the option of running it like a real cartridge, boot up without save state, yet access the battery backup. I agree. I wonder if any of the newer versions have updated the functionality of the battery saves. I haven’t used the program in a while to check. haha, i’m laughing because literally the exact same thing just happened to me with mother 3… I had just started chapter 5 when my mac unexpectedly restarted and now I am back to the beginning of chapter 2. so frustrating!!!! This reply is pretty late, but I hope you got through the game. It’s pretty amazing. This reply is even later, but yes I did end up finishing it… And boy, you weren’t kidding. Fantastic game. I’d say I would play it again, but there was just too much crying involved… Maybe I’ll start a new game and just never play past chapter 1. There, nothing bad can happen now! More like never play past the first 30 minutes to an hour.